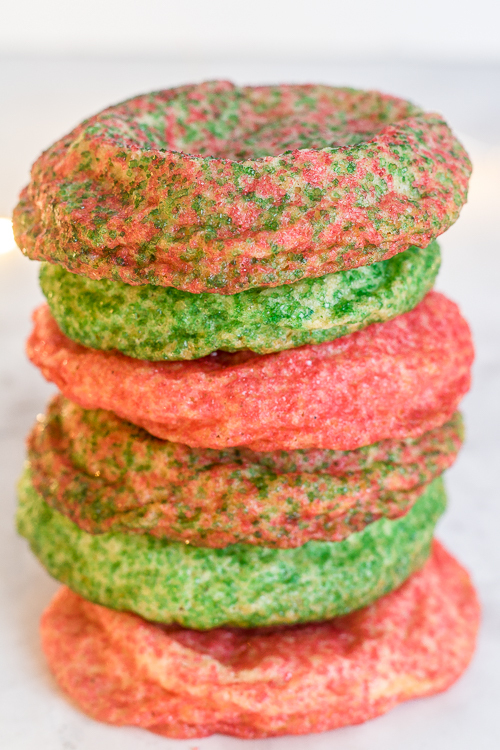 Soft sugar cookies rolled in festive holiday colors, perfect for a big party platter! You guys have no idea how lucky you are! 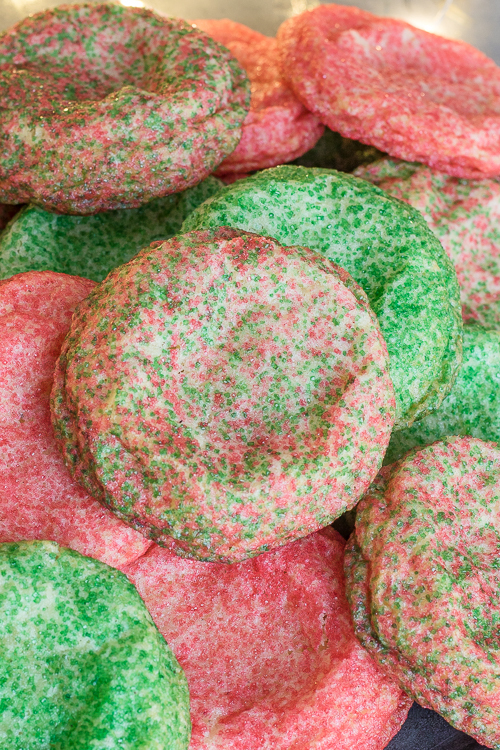 You are about to get my famous, tried and true sugar cookie recipe. 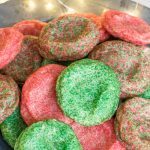 I have been making these sugar cookies for about 8 years now and they come out perfect every time! This is the first time I have made these easy sugar cookies rolled in colored sugar. It gives a nice crunchy exterior and they just look super cute! However, you don’t have to roll them in sugar at all. 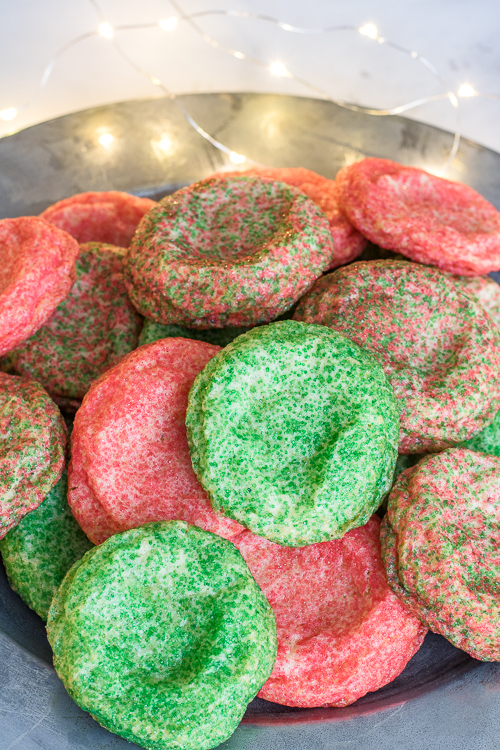 You can leave them plain, add regular sprinkles, or just a light dusting of colored sugar on top, no biggie! Make these your own! Mix flour, baking soda, baking powder, and salt in a medium-sized bowl, set aside. In a large bowl, cream together softened butter and sugar with a hand mixer. Add egg and vanilla. Slowly add dry ingredients to the wet. Alternate adding milk in between adding the dry ingredients. Chill dough in the fridge for at least one hour, I suggest overnight for fluffier cookies. Roll into 1 tablespoon sized balls, roll in colored sugar and bake 8-10 minutes until slightly golden brown around the edges. Let cool on a wired rack. YUMMM, these are Jeremy’s favorite cookies EVER. I don’t make them very often though because I like to keep them as a special treat. Have fun! Add different extracts to the mix to add a special touch, try 1/2 teaspoon of almond, peppermint, or lemon! Add a yummy powdered sugar glaze, drizzled chocolate, or make sugar cookie sandwiches with the best fluffy buttercream frosting! 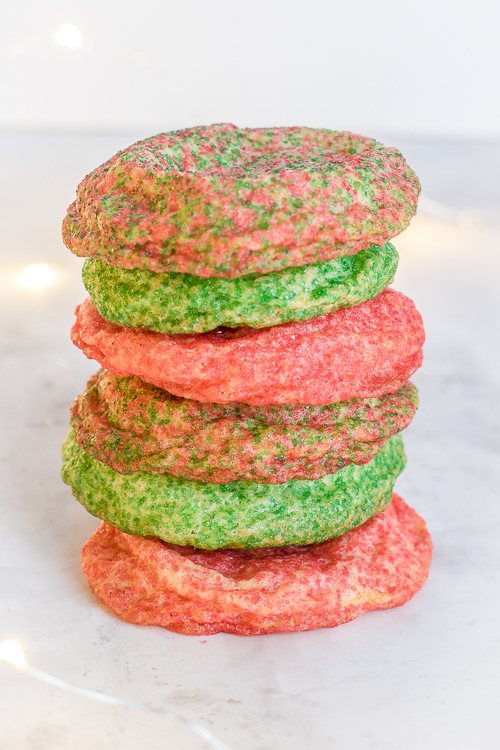 I hope you love these easy sugar cookies as much as we do! I know they will be the best sugar cookies you have ever tasted! For even more yummy recipes, please visit my blog https://ThisSillyGirlsKitchen.com, see you there! In a medium-sized bowl, add the flour, baking soda, baking powder, and salt, mix to combine, set aside. In a large bowl using a stand or hand mixer, cream together the butter and sugar until combined. Add the egg and vanilla, mix to combine. Slowly add the dry ingredients, alternating with the milk until fully incorporated. Start with 3 tablespoons of milk, if dough seems dry add the last tablespoon. Place in the fridge at least one hour to chill, I suggest waiting overnight if you can. Preheat oven to 375 degrees. Roll dough into 1 tablespoon sized balls, roll in colored sugar and place on a parchment or silicone lined baking sheet about 2 inches apart. Bake for 8-10 minutes, until the edges are slightly golden brown, do not overbake. Let cool on a wired rack.